If you like cartoons you’re undoubtedly familiar with the iconic Scooby Doo, a mystery-solving Great Dane who’s the epitome of a “gentle giant.” Real-life Great Danes may not frequently join detectives in their investigations, but they do have wonderful temperaments and a never-ending supply of love to give their human family members. Learn about the largest dog breed by reading on below! Great Danes were originally bred by Germans to aid boar hunters and to serve as guard dogs. Over time, however, they were bred to be more suitable for companionship and have flourished as family dogs ever since. While every dog has their own personality, Great Danes are known for being very affectionate, highly social, and overall well suited for family life. With that said, Great Danes are also protective, especially of their family, and this makes both proper socialization and training all the more important for this breed. They’re also, perhaps surprisingly, not known for being the most energetic of breeds. While they need adequate exercise like any other dogs, Great Danes are remarkably adaptable and do well indoors, even in apartments. Other aspects of care, such as grooming, are also relatively easy with the Great Dane. A weekly brushing tends to be sufficient, especially to help control shedding. Great Danes do shed a fair bit, but if you already vacuum regularly, it will be a manageable shedding season for you and your Great Dane. You will want to consider appropriate toys and ways to play with this massive breed. This is because Great Danes love being silly but sometimes don’t know their own strength. NOVA Pets can be of service by giving your Great Dane additional exercise with our Doggie Day Camp! Finally, part of being a responsible pet parent is cleaning up after your pet’s waste. Bear in mind that such a large breed produces waste that might make you think it came from a horse! If this will make you squeamish, then the Great Dane is likely not for you. If, on the other hand, you’ve already bought some bags and even a scoop, check out some local Great Dane rescues! 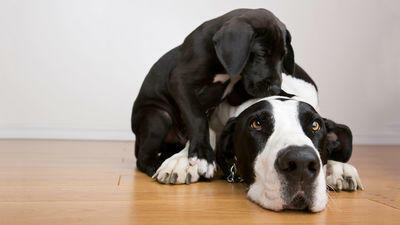 As with any other breed, there are some health issues that Great Danes are more likely to experience than other breeds. For instance, Great Danes are unfortunately prone to dilated cardiomyopathy, a condition in which the heart’s chambers become enlarged (dilated), compromising the ability of the dog’s heart to pump blood to other parts of the body. Nonetheless, a healthy diet, exercise, and regular checkups will help ensure that you keep your guardian angel around as long as possible. If you’ve read this blog and are itching to get a Great Dane for yourself or your family, or if you already have a dog who stands taller than you on two legs, call NOVA Pets Health Center at (703) 378-9791 to arrange an examination. Also, don’t forget to check out our wellness plans to keep your “Dane” feeling Great while saving your money too!